The story of the Footballer’s Battalion in the 1914-1918 Great War is well known, but its formation, and subsequent decimation in the conflict, is merely the tip of an iceberg on which professional football in Scotland came close to being broken up in the early months of the First World War. 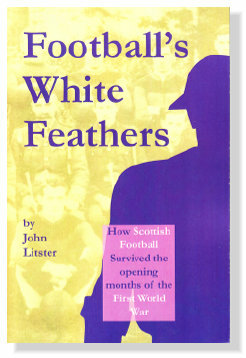 In over 100 pages of narrative, Scottish football’s reaction to the outbreak of war is described, followed by the huge public outcry for football to be stopped as it was allegedly preventing young men from volunteering for the slaughter on the Western Front. Football’s climb-down, along with the public relations triumph of the formation of McCrae’s Battalion, is described in great detail, as are the consequences for Scottish football from the disruption of the war years. Also included are comprehensive statistics from 1914-15 season; full results and scorers, match-by-match appearance grids for all First Division and (uniquely) Second Division clubs, and a detailed analysis of what the First World War did to the footballing careers of the Scottish League players of 1914-15. Scottish Football’s Battle for Survival during the early months of the First World War.